Where is the balancing point for laptops? Where does the touchscreen and brushed aluminium finish start to outweigh the need for unbridled power and portability? Can Full HD and wafer-thinness really step into the void left by an underperforming battery? These are important questions. And we're about to find out the answer to them, with the HP Spectre XT TouchSmart Ultrabook 15-4000ea. The HP Spectre XT TouchSmart Ultrabook is a great computing enigma. It's why we started with philosophy and confusion. It's a jumble of chips in a tiny box that does a number of things brilliantly and a few, sadly, quite poorly. But before we explore specifics, let's start with the laptop's biggest impact point: it goes straight for the psyche before you've even switched it on. 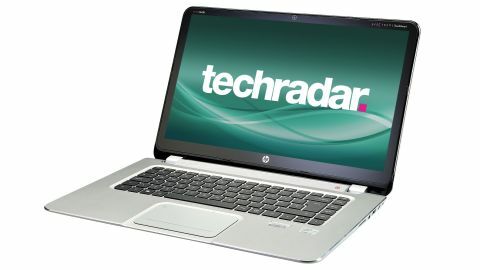 HP is certainly not messing about, then, in terms of the Spectre XT TouchSmart Ultrabook's initial wow factor. It's thin - of course it is, it's an ultrabook - with a deliciously brushed metal lid and wonderfully tactile silicon-coated base. Although it lacks the immediate impact of the glassy, miniscule Acer Aspire S7 (which we're a little bit in love with, to be frank) the HP Spectre XT TouchSmart Ultrabook is a perfectly lovely machine to look at. You could show it off. For a machine in the same price band as the Sony Vaio Duo 11, Toshiba U920T and the aforementioned Acer Aspire S7, that's one important tick in the box. Speaking of price, the HP Spectre XT TouchSmart Ultrabook costs £999 / US$1,199.99 (around AU$1,463). Opening it up, the style continues with a huge raised, countersunk, glassy-feeling touchpad. Island-style keys - almost impeccably laid out, our only gripe being the compressed directional pad and HP's infuriatingly twee lower-case naming convention - dominate the middle ground. There's no unnecessary number pad, which is nice; the temptation must have been there, given the vast amount of case space afforded by the HP Spectre XT TouchSmart Ultrabook's 15-inch flush-mounted widescreen touch panel. So here's the awesome thing about the HP Spectre XT TouchSmart Ultrabook: the screen. Man, what a screen. Not only is it enormous, touchable, generous with the viewing angles (and did we mention enormous? ), it's a Full HD panel running at 1920 x 1080 - something that would be much more common on Ultrabooks if they weren't all so very small. HP has pushed the boat out with its 15 inches, making the HP Spectre XT TouchSmart Ultrabook a significant slab of computing indeed. It's like the laptops we used to know, only without the sharp edges and leg-melting heat. Everything within is very sensible. The processor - a mildly disappointing Intel Core i5 3317U running at 1.7GHz - is just enough. It's not something that will cook you, but it also isn't something that will let you down in a bind. There's 4GB RAM onboard, which is just enough, again, and we wouldn't like to contemplate upgrading that quotient given the stature of the HP Spectre XT TouchSmart Ultrabook's perfectly ventilated underbelly. For storage, HP has opted for a 500GB/32GB hybrid drive, straddling the line between realistic internal capacity and the solid state speed that Windows 8 all but demands. It's fine, of course, and that extra capacity once again roots the HP Spectre XT TouchSmart Ultrabook in 'proper laptop' territory. Stuffing it with a massive SSD alone would have bumped the price up and reduced the overall usefulness. There are other ultrabooks in the bracket that will offer more grunt under the hood, of course. The Acer Aspire S7 manages a superior Core i7-3517U in its tiny shell, and every other HP Envy Ultrabook seems to tote more RAM. Plump for something fancy - and dare we say it, silly - such as the Lenovo IdeaPad Yoga and you'll get a huge SSD, more RAM and a more versatile touchscreen to boot. But we think HP has the balance right, here.